Gorgeous 3 Bedroom Condo Minutes from Breckenridge!! If you are looking for a home located near multiple world-class ski resorts and has amenities the whole family will enjoy, then this is the home for you! Sitting just minutes from Keystone, Arapahoe Basin and Breckenridge, this 4000 square foot home features 3 levels of luxury for everyone. The main floor welcomes you with large windows, vaulted ceilings, a gorgeous gas fireplace, a gourmet kitchen, and a dining table that seats up to 8. Located off the dining room is a patio with incredible views, a gas grill and outdoor dining set; the perfect place for a cup of coffee in the morning. Off the kitchen is the Master suite with its own gas fireplace, King-sized bed, and a private bathroom with a whirlpool tub! Upstairs you will find the second bedroom with a King bed, the third bedroom with a Queen, and the fourth bedroom with a double bed and shared bath. In the loft area there is a trundle (2 twin daybeds) just above the great room. The huge basement is perfect for a night of fun! Not only will you find a huge flat screen TV and an air hockey table, but also a wet bar with mini fridge. In the basement is bedroom number five with bunk beds with a bottom double and twin on top, and an additional twin bed; sleeping up to 7! This home is equipped with all you’ll need to enjoy a family retreat away or a large group to catch up for the week. Red Mountain Retreat is full of technology, 6 LCD TV’s including 3 “smart” TVs that can access the internet and apps like Netflix. 3 of the TVs come with 3 Blu Ray DVD players, and surround-sound in the lower level entertainment area. Your backyard is adjacent to the Dillon Nature Preserve with hundreds of acres of pristine wilderness, views of Lake Dillon and the Rockies, and over 26 expansive miles of trails for hiking, jogging, snowshoeing, and cross country skiing. Just down the road you will find the club house which has an exercise room with treadmills, ellipticals and a weight machine. And if you stay with us in the summer months, you have full access to the club house swimming pool! Red Mountain Retreat is situated in the beautiful Summer Wood area of Dillon between Keystone and Silverthorne. It has a clubhouse with a swimming pool and tennis (summer only), hot tubs, racquetball and basketball courts (all year round). 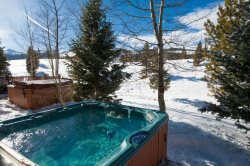 A washer and dryer, gas range, two ovens, 6 LCD televisions, two gas fireplaces, a two car garage and beautiful views of Keystone Mountain. Other amenities include high speed internet and WiFi, 6 LCD TV's including 3 'smart' TVs with internet access and apps like Netflix, 3 BlueRay DVD players, and surround-sound downstairs in the entertainment lounge. There are two wifi router options that will appear And the password works for both. One is 2.4 ghz the other is 5ghz and either can be used. Some older pcs will not work with the 5ghz.